McALLEN — They were both deployed to Afghanistan in February 2011; young and eager, the two friends went on to serve successful careers in the military. Seven years later, Veteran Marine Corps Cpl. 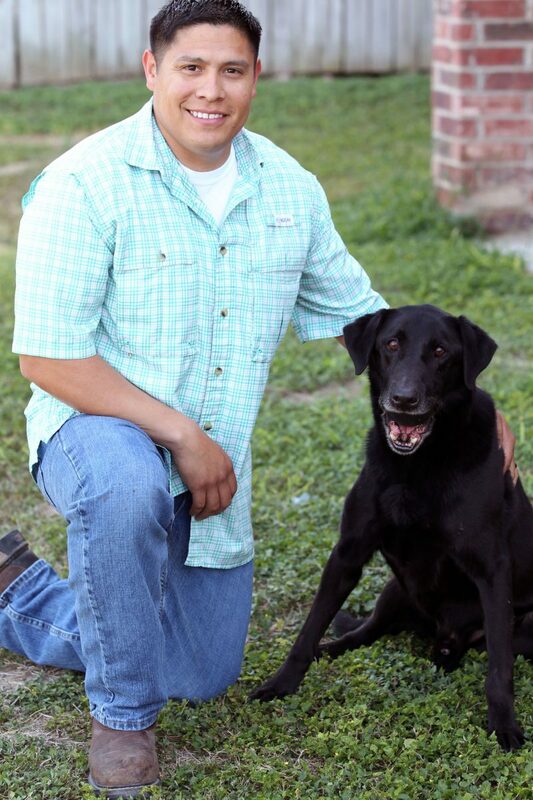 Nicolas Caceres, and Fieldy, a retired U.S. Marine Corps service dog still remain great friends. They now live together with Caceres’s wife, Brianna Caceres and their 3-year old son, Niko, in their home in McAllen. 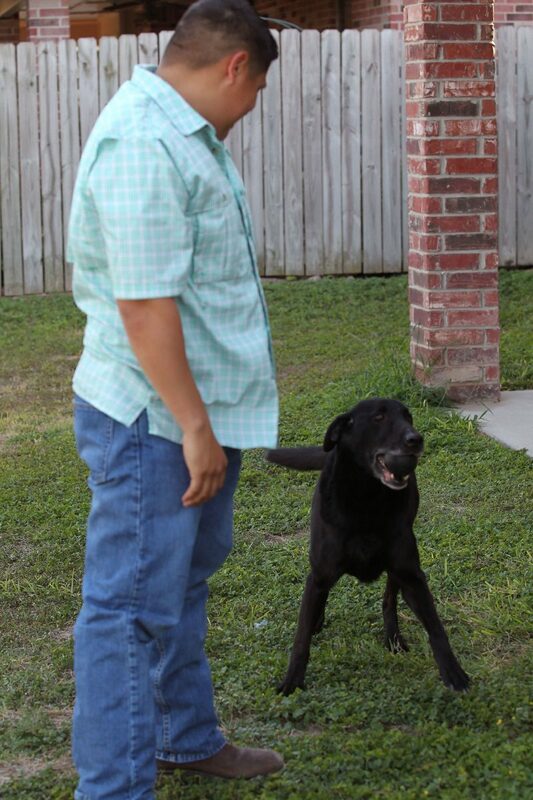 Veteran Nicolas Caceres and his dog "Fieldy" at home Wednesday March 21, 2018, in McAllen. Caceres worked with "fieldly" while a tour of duty in Afghanistan. He was reunited with his dog in 2014. 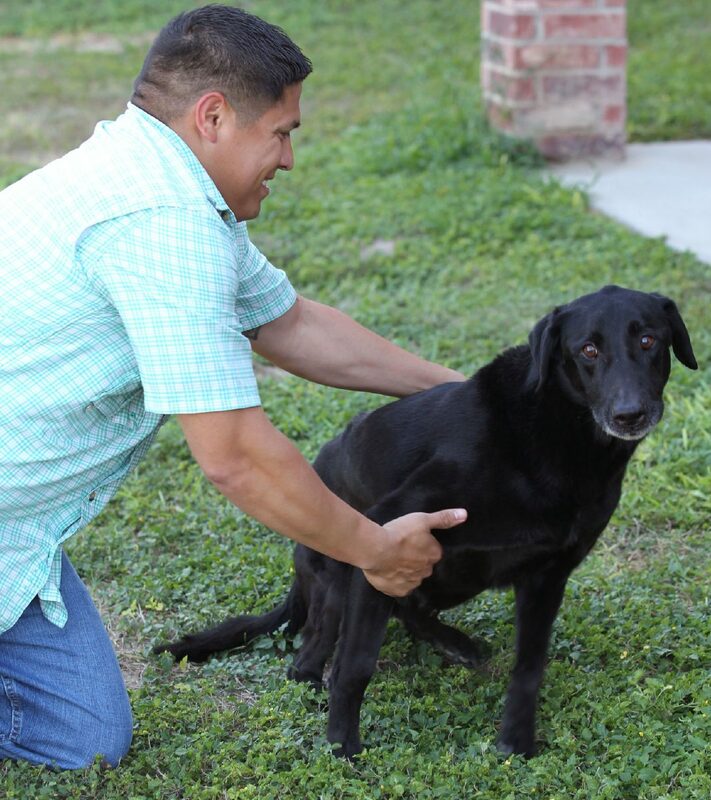 Veteran Nicolas Caceres tries to get his dog "Fieldy" to pose for a picture while at home Wednesday March 21, 2018, in McAllen. Caceres worked with "fieldly" while in Afghanistan. He was reunited with his dog in 2014. "Fieldy" wants to ply catch with his owner Nicolas Caceres while at home Wednesday March 21, 2018, in McAllen. Caceres worked with "Fieldly" while in Afghanistan. He was reunited with his dog in 2014. Caceres, who is now a wildlife officer stationed at Santa Ana National Wildlife Refuge, served in the U.S. Marine Corps from 2009 to 2013. In 2011, he met Fieldy before they were deployed to Afghanistan, where Fieldy would sniff out improvised explosive devices placed by the Taliban. When they’d find a suspicious item, they would guide Fieldy toward it using hand signals and whistles, then he would sniff it out and determine if it was a bomb. When it was, he’d lay down and look directly at Caceres. After Caceres came home in 2013, Fieldy was deployed two more times before retiring. On Aug. 7, 2014, with the help of American Humane Association, Caceres was able to adopt him, and the two were united at Valley International Airport in Harlingen. The family adopted Fieldy a few months before the birth of their first son, Niko, and now the two or inseparable. When Niko was a newborn, Fieldy would guard Niko’s crib and follow him around when a stranger carried him. Now, the 3-year-old is his favorite playmate. At 11-years-old, Fieldy still plays fetch relentlessly. When tossed the ball, he’ll sprint toward it — swiftly dogging any objects in his path — then trots back toward the thrower. Once Fieldy has the ball in his mouth, he’s stubborn to let it go — unless you’re Niko, that is. Fieldy releases the ball almost immediately for him. Niko’s parents have to pry it out a bit, usually resulting in a palm full of slobber. Fieldy and 265 other canines are competing to win the American Humane Hero Dog Award, which honors service dogs around the nation. “The American Humane Hero Dog Awards are our way of celebrating the power of the human-animal bond, which has been a core part of our organization’s mission for 141 years,” Dr. Robin Ganzert, American Humane’s president and CEO, stated in a news release. The first round of voting runs until April 25. Every individual can vote once per day, and the winning canine will earn $2,500 for their designated charity. Fieldy’s charity is the SD Gunner fund, an organization that aids veterans and disabled children with the financial expenses of owning service animals. To browse through the canine nominees and cast a vote, visit: http://herodogawards.org.